Recently I had the opportunity to facilitate a retreat for the staff and board members of a local non-profit. At the retreat, we played a game called Barnga, an inter-cultural learning game that gives people the opportunity to experience a little of what it feels like to be a “stranger in a strange land”. To play Barnga, people sit at tables of four. 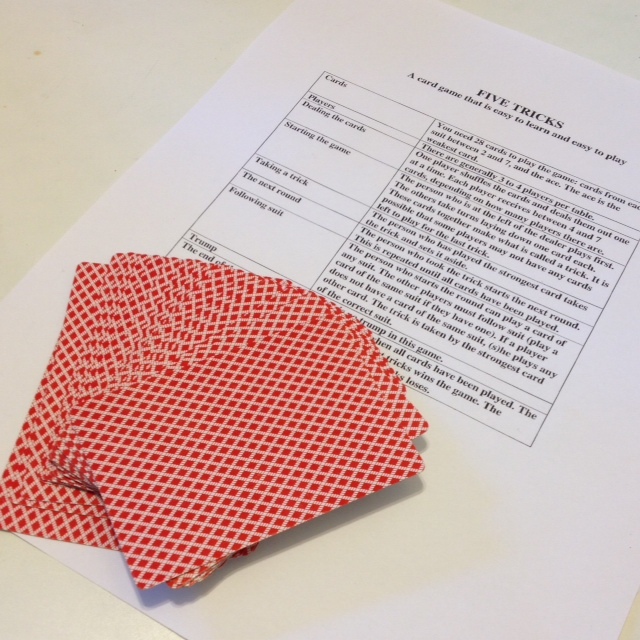 Each table is given a simple set of rules and a deck of cards. After reading the rules, they begin to play a couple of practice rounds. Once they’re comfortable with the rules of play, they are instructed to play the rest of the game in silence. After 15 or 20 minutes of playing in silence, the person who won the most tricks at each table is invited to move to another table. The person who won the least tricks moves to the table in the opposite direction. All of the rules sheets are removed from the tables. The game begins once again, but what people don’t realize until they’ve played a round or two is that the rules are different at each able. At some tables, ace is high and at other tables it’s low. At one table, diamonds are trump, at another clubs are trump, and so on. Newcomers (ie. immigrants) have now arrived in a place where they expect the rules to be the same, find out after making a few mistakes that they are in fact different, and have no shared language to figure out what they’re doing wrong. Around the room you can see the confusion and frustration begin to grow as people try to adapt to the new rules, and those at the table try to use hand gestures and other creative means to let them know what they’re doing wrong. After another 15 or 20 minutes, the winners and losers move to new tables and the game begins again. This time, people are less surprised to find out there are different rules and more prepared to adapt and/or help newcomers adapt. After playing for about 45 minutes, we gathered in a sharing circle to debrief about how the experience had been for people. Some shared how, even though they stayed at the table where the rules hadn’t changed, they began to doubt themselves when others insisted on playing with different rules. Some even chose to give up their own rules entirely, even though they hadn’t moved. In the group of 20 people, there was one white male and 19 women of mixed races. What was revealing for all of us was what that male was brave enough to admit. It should be stated that this man is a stay-at-home dad who volunteers his time on the board of a family resource centre. He is by no means the stereotypical, aggressive white male you might assume him to be. He is gracious and kind-hearted, and I applaud him for recognizing what he’d done. What is equally interesting is that all of the women at the tables he moved to allowed him to enforce his set of rules. Whether they doubted themselves enough to not trust their own memory of the rules, or were peacekeepers who decided it was easier to adapt to someone else who felt stronger about the “right” way to do things, each of them acquiesced. Without any ill intent on his part, this man inadvertently became the colonizer at each table he moved to. And without recognizing they were doing so, the women at those tables inadvertently allowed themselves to be colonized. If we had played the game much longer, there may have been a growing realization among the women what was happening, and there might have even been a revolt. On the other hand, he might have simply been allowed to maintain his privilege and move around the room without being challenged. Since that game at last week’s retreat, the universe has found multiple opportunities to reinforce this learning for me. I have been reminded more than once that, despite my best efforts not to do so, I, too, sometimes carry my rules with me and expect others to adapt. Yesterday, these lessons came from multiple directions. In one case, I was challenged to consider the language I used in the blog post I shared yesterday. In writing about the race relations conversation I helped Rosanna Deerchild to host on Monday night, I mentioned that “we all felt like we’d been punched in the gut” when our city was labeled the “most racist in Canada”. Several people pointed out (and not all kindly) that I was making an assumption that my response to the article was an accurate depiction of how everyone felt. By doing so, I was carrying my rules with me and overlooking the feelings of the very people the article was about. Not everyone felt like they’d been punched in the gut. Instead, many felt a sense of relief that these stories were finally coming out. In the critique of my blog post, one person said that my comment about feeling punched in the gut made her feel punched in the gut. Another reflected that mine was a “settler’s narrative”. A third said that I was using “the same sensationalist BS as the Macleans article”. I was mortified. In my best efforts to enter this conversation with humility and grace, I had inadvertently done the opposite of what I’d intended. Like the man in the Barnga game, I assumed that everyone was playing by the same set of rules. I quickly edited my blog post to reflect the challenges I’d received, but the problem intensified when I realized that the Macleans journalist who wrote the original article (and who’d flown in for Monday’s gathering) was going to use that exact quote in a follow-up piece in this week’s magazine. Now not only was I opening myself to scrutiny on my blog, I could expect even harsher critique on a national scope. I quickly sent her a note asking that she adjust the quote. She was on a flight home and by the time she landed, the article was on its way to print. I felt suddenly panicky and deeply ashamed. Fortunately, she was gracious enough to jump into action and she managed to get her editor to adjust the copy before it went to print. Last night, I went to bed feeling discouraged and defeated. On top of this challenge, I’d also received another fairly lengthy email about how I’ve let some people down in an entirely different circle, and I was feeling like all of my efforts were resulting in failure. At 2 a.m., I woke in the middle of what Brene Brown calls a “shame shitstorm”. My mind was reeling with all of my failures. Despite my best efforts to create spaces for safe and authentic conversation, I was inadvertently stepping on toes and enforcing my own rules of engagement. As one does in the middle of the night, I started second-guessing everything, especially what I’d done at the gathering on Monday night. Was I too bossy when I hosted the gathering? Did I claim space that wasn’t mine to claim? Were my efforts to help really micro-aggressions toward the very people I was trying to build bridges with? Should I just shut up and step out of the conversation? By 3 a.m., I was ready to yank my blog post off the internet, step away into the shadows, and never again enter into these difficult conversations. By 4 a.m., I’d managed to talk myself down off the ledge, opened myself to what I needed to learn from these challenges, and was ready to “step back into the arena”. Some time after 4, I managed to fall back to sleep. This morning, in the light of a new day, I recognize this for what it is – an invitation for me to address my own shadow and deepen my own learning of how I carry my own rules with me. If I am not willing to address the colonizer in me, how can I expect to host spaces where I invite others to do so? Nobody said this would be easy. There will be more sleepless nights, more shame shitstorms, and more days when my best efforts are met with critique and even anger. But, as I said in the closing circle on Monday night, I’m going to continue to live with an open heart, even when I don’t know the next right thing to do, and even when I’m criticized for my best efforts. Because if I’m not willing to change, I have no right to expect others to do so. You’re doing good work, Heather. Good work for the community and good work on yourself. Hang in there. Lead on. Thanks Liz. Yes, this is challenging terrain we’ve chosen to step into, but I don’t think we have any choice. Either we do the hard work, or we allow things to get worse. Heather, I just had a chance to read this and I’m sitting a little taller in my seat. This important work you are doing is *so* not easy(and shame shitstorms are NO fun), but you *are* doing it! From this side of the screen, I see you daring greatly all while courageously, open-heartedly, and with a beginner’s mind, willing to learn as you go. I am proud and honored to know you, to have worked with you, and to call you friend. You and your work are a very beautiful thing. Cheering you on as you continue to find your way. Courageous and inspiring post! Thank you! Thank you for weathering you ‘shitstorm of shame’ and having the courage to dare greatly (Yes, I am a big Brené Brown fan) in service of so many of us who share inadvertant beliefs, be it colonialism, racism, etc. Thanks for this gentle provocation! As a white male, I too don’t want to impose my own rules where-ever I go. So I don’t want to be like the guy playing Barnga in your blog. But I also don’t want to be like the women playing Barnga in your story, who (passively) allowed someone else’s rules to be constantly imposed on them. Neither coloniser, nor doormat – what is the third alternative? There doesn’t seem to be one readily achieved in Barnga, but is there one in life?